One of the underlying themes of CES this year was the transition to 4K displays. AMD had a 4K (4096 x 2160) demo at its booth driven by a Radeon HD 7970. Most 4K displays require multiple inputs, which was the case in AMD's demo. Two DisplayPort outputs from the 7970 drive the panel in the shot above. AMD ran both video playback and a 3D rendered test as a proof of functionality. If the high-end of the PC space moves to 4K eventually that will continue to drive high-end GPU demand thanks to the 2.1x increase in pixel count over a standard 30-inch display. 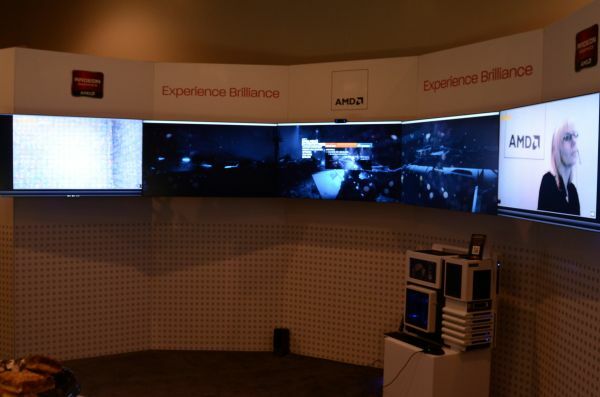 AMD also had a 5x1 Eyefinity setup (not using 4K displays) running off of two 7970s showing a video conferencing app (ooVoo) running alongside Battlefield 3. This was of course one of the original intents of Eyefinity: to deliver a more immersive experience. The addition of video conferencing is a nod to a usage model where you are not only playing a game that makes you feel immersed but you're also able to look to your left and right and see your teammates. From the article: "Most 4K displays require multiple inputs, which was the case in AMD's demo"
I'm pretty sure AMD was promoting their graphic cards as a source for these display. Only improved ROP efficiency, granted, by the time 4K and higher displays become common place the 7970 will be ancient history, but still, can't help but be disappointed by the 7970's conservative design, although I'm sure that helped it in actually making it out to market while we're still such a long ways off before we get Kepler.